Glico Brand Chicken Rice flavour sachet. ¥100, Daiso 100 Yen shop, Harajuku, Tokyo. The coolest shop in the world is, without a doubt, the Daiso 100 Yen Shop. Daniel, my brother and fellow Japan-o-phile, you can keep your Bathing Apes, your Evisu Jeans and your Shibuya 109s, the Daiso 100 Yen Shop is the place for me. There are big ones in Nara, Harajuku, Ueno, the Rox building in Asakusa, and pretty much all over Japan. You can buy everything there, for a mere 100 yen! Especially exciting are the range of household and cooking products - flavour sachets, soft drinks, cake boxes, muffin papers, foil trays, tempura drainers, tongs, measuring cups, green plastic grass-shaped liners for your bentohs and more! You can imagine how much I love this store, and the ridiculous amounts I purchased over 3 weeks in Japan. (The cost of shipping everything home far outweighed the cost of the items themselves, but now is not the time to worry about that). Now, the chicken rice. I didn't send that home, but instead brought it to Germany with me. Despite the name, it doesn't have any discernible 'chicken' in it, just chicken flavour. It's good. 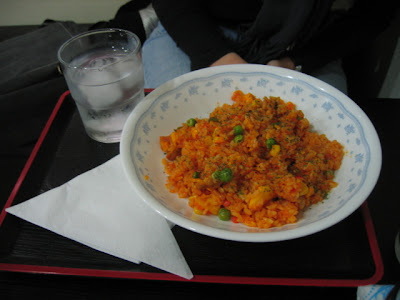 The first time we had Japanese chicken rice was at Cafe Do Pearl, a tiny little cafe in Ise. Ise is a small, quiet town, home to Japan's most sacred Shinto site and architectural wonder - the Ise-jingu. It houses the Sun Goddess, Amaterasu, and is rebuilt from scratch every 20 years, don't you know. Cafe Do Pearl's Chicken Rice. We were surprised by the lack of chicken pieces, but impressed with the taste. Cafe do Pearl's interior. It seems to be a one-woman show, and I assume that the proprietress lives upstairs. Meanwhile, back at das ranch, we made up that Glico Chicken Rice for dinner last night, having had some leftover cooked rice. You start by frying an egg in some butter or oil, then stirring in the cooked rice. Once the rice and egg are mixed together, you throw in the powder sachet, and stir some more. Next is the sauce sachet. Then stir until all is thoroughly mixed and heated through. It wasn't quite as moist or intensely flavoured as the one at Cafe do Pearl, but still good. It was very quick, and comforting without being stodgy or artery-clogging. Why isn't packet food in Australia this good? 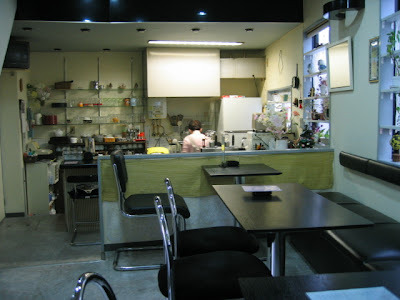 I like small mom and pop restaurants like that Cafe do Pearl. The rice looks good but what is the spice and sauce if one were going to make it completely homemade?